What Is Tennessee's State-Funded Primary Care Safety Net? Tennessee’s state-funded primary care safety net focuses on services that help uninsured adults age 19-64 avoid more costly hospitalizations. Each type of primary care safety net provider — local health departments, community health centers, and community- and faith-based clinics — have unique missions, revenue sources, and service capacities. Definitions of the “health care safety net” vary according to the state, community, or context in question. (1) (2) Depending on the definition, it can include everything from state Medicaid programs to a narrow set of providers offering charity care. State funding for the primary care safety net comes through the Tennessee Department of Health (TDH). 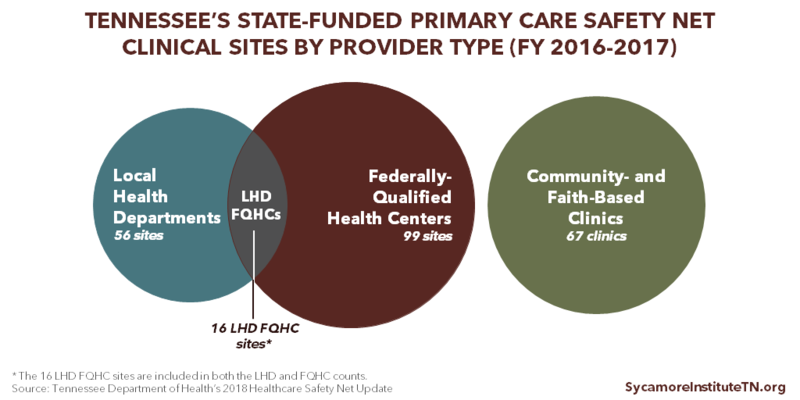 FQHCs and CFBCs receive dedicated primary care safety net funding, while LHDs use money from the general operating budgets they receive though TDH. Information on the breakdown of LHD budgets is not available. For primary care safety net services at FQHCs and CFBCs, the 2005 task force recommended a combined total of $14.7 million in annual state funding. (12) Since 2006, the amount budgeted by the state has ranged from $6.0 million in FY 2006-2007 to $13.6 million in FY 2007-2008, although actual expenditures have been lower in the years for which expenditure data are available (Figure 2). Recent changes to how funds get distributed are expected to bring actual expenditures closer to budgeted amounts. Most safety net providers also have other sources of revenue, which vary by community and provider type. 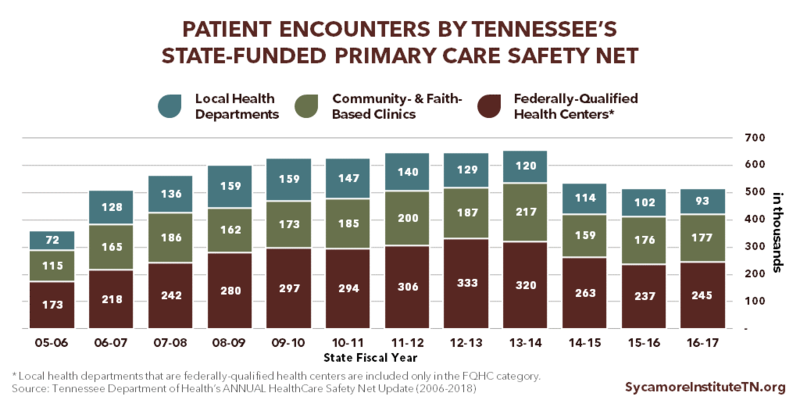 Tennessee’s state-funded primary care safety net included over 200 clinics and care delivery sites operated by LHDs, FQHCs, and CFBCs in FY 2016-2017. (4) (Figure 3) It also supports care coordination in 4 metro areas through Project Access. The remainder of this report describes each provider type in greater detail. To the extent that data are available, it also discusses how state-funded primary care safety net services fit into each provider type’s other functions, services, and funding sources. LHDs that provide primary care services do not receive dedicated safety net funding. Instead, primary care services are supported by their operating budgets from TDH, which support a range of public health services provided by LHDs. Information on the breakdown of LHD budgets is not available. To be designated a federally qualified health center (FQHC), a provider must meet specific federal guidelines for funding, services, fee-structure, and patients. Most FQHCs must serve a medically underserved area or population, provide comprehensive services with a sliding fee scale, have a patient- and community-oriented governing board, and be awarded a competitive grant from the Health Resources and Services Administration (HRSA). The FQHC designation also comes with other benefits like bundled payments under Medicaid and Medicare and opportunities to participate in federal programs like 340B drug pricing. (22) “FQHC look-alikes” are centers that meet all FQHC requirements and qualify for but do not receive HRSA funding. In FY 2016-2017, state safety net funding supported care at 99 sites operated by FQHCs in Tennessee. (4) In total, Tennessee has nearly 190 clinical care delivery sites operated by 30 federally-funded FQHCs and 1 “FQHC look-alike.” (4) (23) (24) Of those 190 sites, 16 are run by LHDs that have been designated as FQHCs. The dedicated TDH safety net funding helps FQHCs offset the cost of caring for uninsured adult patients. Funding amounts are based on total available funding and each clinics’ number of eligible patient encounters. The following information encompasses care supported by both state and federal funding. 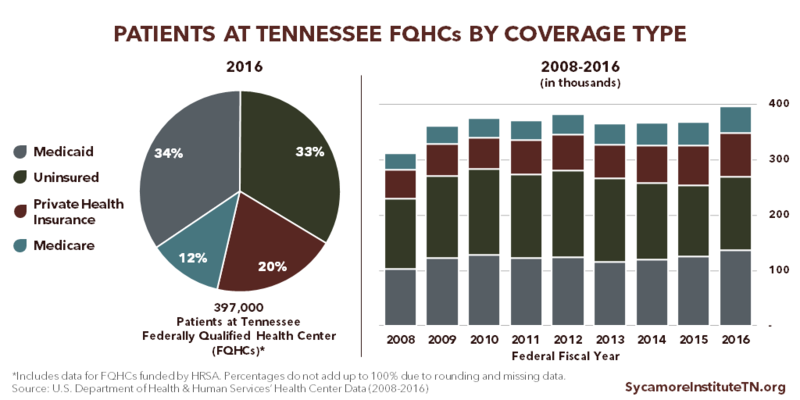 Tennessee’s FQHCs served nearly 400,000 patients during 1.4 million clinic visits with over 2,500 full-time staff — including over 1,000 full-time medical personnel — in federal FY 2016. The safety net-supported visits reported for state FY 2015-2016 (Figure 1) would account for roughly 17% of total FQHC visits (although the measurement periods do not perfectly align). 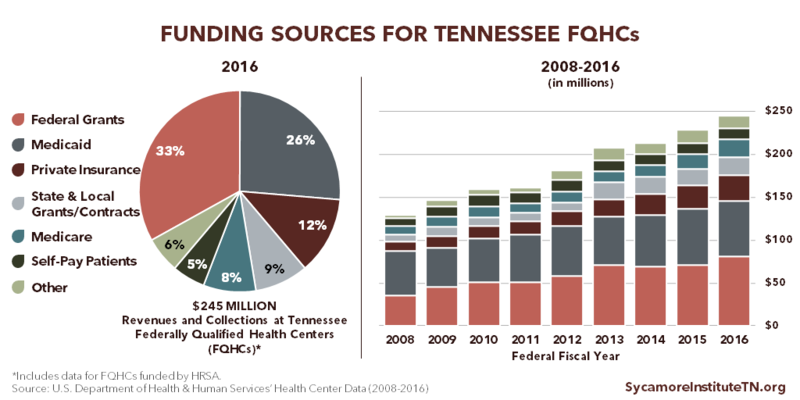 Revenues for Tennessee’s FQHCs come from a mix of public and private health insurance payments and federal, state, and local government support. (Figure 5) In federal FY 2016, Tennessee’s federally-funded FQHCs had combined expenditures of about $235 million ($8 million per FQHC, on average), and their top 3 sources of revenue were federal grants (33%), TennCare (26%), and private health insurance coverage (12%). State and local contracts and grants (which includes state funding for the primary care safety net) accounted for 9%. Private health insurance payments grew from 8% of all revenues in 2008 to 12% in 2016. This may reflect, at least in part, the increase in the share of patients with private coverage. Reimbursements from TennCare declined from 40% of all revenues to 26%. State and local grants and contracts grew slightly as a share of all funding, from 7% to 9%. In FY 2016-2017, 67 CFBCs in Tennessee received state safety net funding. 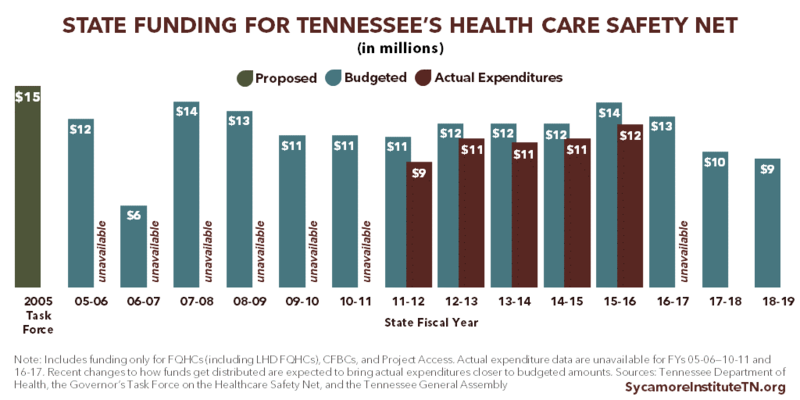 (4) Although a precise number is unknown, other CFBCs also provide care in Tennessee but do not get money from the state’s primary care safety net fund. The dedicated TDH safety net funding helps CFBCs offset the cost of caring for uninsured adult patients. Beginning in FY 2017-2018, state funding is distributed to both FQHCs and CFBCs based on total available funding and each clinics’ number of eligible patient encounters. Previously, CFBC payments were based on a set rate per-encounter. This new methodology is expected to result in actual expenditures that are more in line with budgeted amounts. Project Access networks coordinate specialty care for uninsured individuals in 4 areas of Tennessee. (4) The 4 networks, which all receive state safety net funding, include Project Access Nashville, Appalachian Mountain Project Access, Hamilton County Project Access, and Knox County Project Access. Taylor, Jessamy. 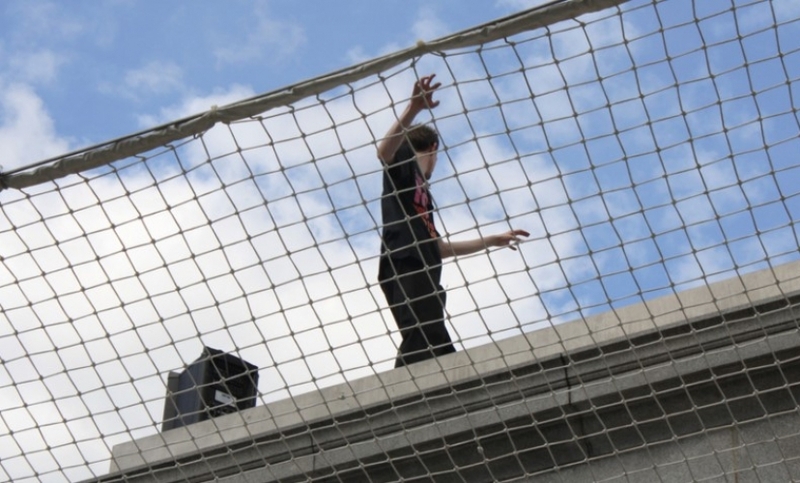 The Primary Care Safety Net: Strained, Transitioning, Critical. The National Health Policy Forum. [Online] September 28, 2010. http://www.nhpf.org/library/background-papers/BP79_PrimaryCareSafetyNet_09-28-10.pdf. Institute of Medicine. 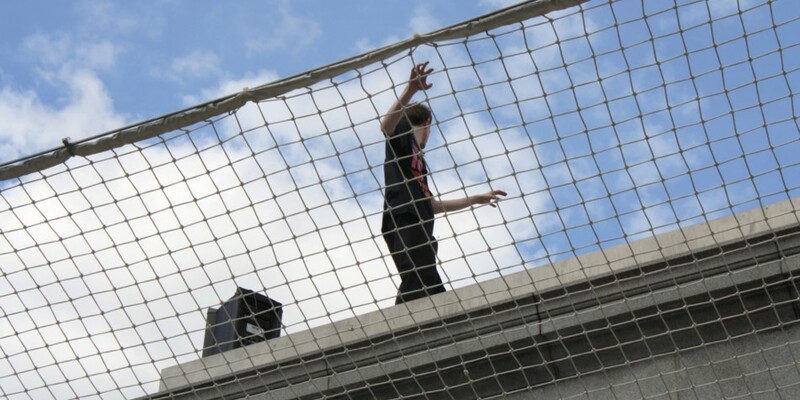 America’s Health Care Safety Net: Intact but Endangered. [Online] 2000. Accessed via https://doi.org/10.17226/9612 . U.S. Census Bureau. American Community Survey 1-year estimates. [Online] 2016. [Accessed on April 3, 2018.] Accessed via http://factifinder.census.gov. Tennessee Department of Health. Healthcare Safety Net Update. [Online] January 2018. https://www.tn.gov/content/dam/tn/health/documents/Safety%20Net%20Report_FY17.pdf. Starfield, Barbara, Hi, Leiyu and Macinko, James. Contribution of Primary Care to Health Systems and Health. The Milbank Quarterly. [Online] September 2005. https://www.ncbi.nlm.nih.gov/pmc/articles/PMC2690145/. Shi, Leiyu. The Impact of Primary Care: A Focused Reveiw. Scientifica. [Online] 2012. https://www.hindawi.com/journals/scientifica/2012/432892/. Tennessee Department of Health. Update on the Health Care Safety Net. [Online] January 15, 2009. https://www.tn.gov/content/dam/tn/health/documents/HealthCareSafetyNet_AnnualReport_2009.pdf. —. Update on the Healthcare Safety Net. [Online] January 15, 2014. https://www.tn.gov/content/dam/tn/health/documents/HealthCareSafetyNet_AnnualReport_2014.pdf. —. Healthcare Safety Net Update. [Online] January 2017. https://www.tn.gov/content/dam/tn/health/documents/2016_Update_on_the_Healthcare_Safety_Net_Report.pdf. The Tennessee Tribune. Bredesen Statement On Executive Order Establishing The Governor’s Task Force On The Health Care Safety Net. [Online] February 2, 2005. Accessed via http://interfaithhealthclinichere.blogspot.com/2012/09/bredesen-statement-on-executive-order.html. State of Tennessee. Executive Order by the Governor, No. 22. [Online] January 24, 2005. Accessed via https://sos.tn.gov/products/division-publications/2003-2010-executive-orders-governor-bredesen. The Governor’s Task Force on the Healthcare Safety Net. The Recommendations of the Governor’s Task Force on the Healthcare Safety Net. May 24, 2005. State of Tennessee. TN Code § 71-5-148 (2016). [Online] Accessed via https://law.justia.com/codes/tennessee/2016/title-71/chapter-5/part-1/section-71-5-148/. Tennessee General Assembly. HB 2644. [Online] 2018. [Accessed on April 30, 2018.] http://wapp.capitol.tn.gov/apps/BillInfo/Default.aspx?BillNumber=HB2644&GA=110. U.S. Centers for Disease Control and Prevention (CDC) . The Public Health System and the 10 Essential Public Health Services. [Online] September 20, 2017. [Accessed on December 4, 2017.] https://www.cdc.gov/stltpublichealth/publichealthservices/essentialhealthservices.html. Tennessee Department of Health. Local and Regional Health Departments. [Online] [Accessed on January 17, 2017.] https://www.tn.gov/health/health-program-areas/localdepartments.html. National Association of County and City Health Officials (NACCHO). 2016 National Profile of Local Health Departments. [Online] August 2017. http://nacchoprofilestudy.org/wp-content/uploads/2017/10/ProfileReport_Aug2017_final.pdf. Tennessee Department of Health. Services Offered by Local Health Departments. [Online] April 2, 2018. https://www.tn.gov/health/health-program-areas/localdepartments/lrhd/local-services.html. National Association of County and City Health Officials (NACCHO). 2005 National Profile of Local Health Departments. [Online] July 2006. [Accessed on December 5, 2017.] http://archived.naccho.org/topics/infrastructure/profile/upload/NACCHO_report_final_000.pdf. U.S. Centers for Disease Control and Prevention (CDC). FY 2016 Grants Summary Profile Report for Tennessee. [Online] 2017. https://wwwn.cdc.gov/FundingProfilesApp/Report_Docs/PDFDocs/Rpt2016/Tennessee-2016-CDC-Grants-Profile-Report.pdf. —. Public Health Financing. [Online] June 2013. [Accessed on December 4, 2017.] https://www.cdc.gov/stltpublichealth/docs/finance/Public_Health_Financing-6-17-13.pdf via https://www.cdc.gov/stltpublichealth/grantsfunding/index.html#phsf. Health Resources and Services Administration (HRSA). What is a Health Center? U.S. Department of Health and Human Services (HHS). [Online] [Accessed on December 1, 2017.] https://bphc.hrsa.gov/about/what-is-a-health-center/index.html. —. National Health Center Data (2008-2016). [Online] [Accessed on November 3, 2017.] Accessed via https://bphc.hrsa.gov/uds/datacenter.aspx. National Association of Community Health Centers. Key Health Center Data by State, 2016. [Online] November 2, 2017. http://www.nachc.org/wp-content/uploads/2017/11/Key-HC-Data-by-State-2016-11.2.17.pdf. Health Resources and Services Administration (HRSA). Congressional Budget Justifications for FFYs 2014-2018. [Online] 2013-2017. [Accessed on December 5, 2017.] Accessed via https://www.hrsa.gov/about/budget/index.html. National Association of Community Health Centers. The Health Center Funding Cliff and Its Impact. [Online] September 2017. https://d3n8a8pro7vhmx.cloudfront.net/nachc/pages/297/attachments/original/1506523575/The_Health_Center_Funding_Cliff_and_Its_Impact_September_2017.pdf?1506523575. Tennessee Charitable Care Network. Member Charitable Clinic Organizations. [Online] 2017. [Accessed on January 18, 2018.] http://www.tccnetwork.org/find-a-clinic.html. The National Association of Free and Charitable Clinics. Getting To Know America’s Free & Charitable Clinics. [Online] June 2016. http://www.tccnetwork.org/uploads/8/0/4/9/80493622/clinic_talking_points_jun_2016_final.pdf. Tennessee Primary Care Association / Tennessee Charitable Care Network. Health Care Safety Net Fact Sheet. December 2017. Obtained from the Tennessee Charitable Care Network. Switzer-Nadasdi, Rhonda. Letter to Governor Bill Haslam. Tennessee Charitable Care Network. November 2, 2017. Obtained from the Tennessee Charitable Care Network. State of Tennessee. TN Code § 68-1-123 (2016). [Online] https://law.justia.com/codes/tennessee/2016/title-68/health/chapter-1/part-1/section-68-1-123/. Tennessee Department of Health. 2014 Joint Annual Report of Hospitals Summary Report. [Online] September 26, 2015. https://www.tn.gov/content/dam/tn/health/documents/Annual_Report_on_Hospital_Statistics_2015.pdf.